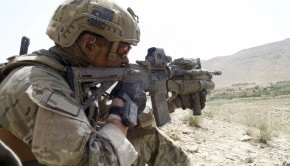 Special Operations Commands (SOCOMD) mission is to provide ready and relevant forces to conduct Special Operations across the operational continuum in a joint, combined or interagency environment, in support of Australian national interests. Special Operations Headquarters manages the direct command units within SOCOMD. 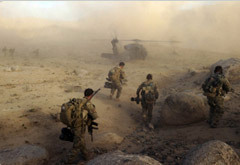 Those units consist of the Special Air Service Regiment, 1st Commando Regiment, 2nd Commando Regiment, Incident Response Regiment and Special Operations Logistics Squadron. 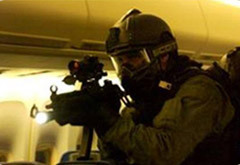 With its origins in the Directorate Special Action Forces Army in 1979, and later Headquarters Special Forces - in 2003, the Australian Government directed the establishment of a Special Operations Command. The command would be equal in status to Maritime, Land and Air Commands, in order to enhance Australias ability to use non-conventional warfighting means to respond to the asymmetric threat of terrorism. To provide personnel and equipment postured to meet special operations tasking spanning the operational continuum in the defence of Australia and in support of national interests. The 1st Commando Regiment is truly unique within Army; as the oldest unit within Special Operations Command, the Regiment has provided an unbroken conduit for the passage of experience from WWII Commando forefathers to the modern Australian special operations community. Today, the 1st Commando Regiment contains some of the most skilled, dedicated and combat experienced soldiers within the Army. Over the past decade, combat operations and the evolution of the commando trade model have changed the character of the 1st Commando Regiment. The Regiment has evolved from a unit with limited operational utility to one built on a core of highly skilled individuals able to integrate into regular army special operations with little notice. As a result, the Regiment is being increasingly relied upon to supplement the efforts of regular Army special forces counterparts on both operations and in training. The Regiment is an integrated unit comprising a high number of regular (full time) soldiers, ex-regular and reserve (part time) soldiers, who are all required to meet the same rigorous standards of a regular commando. The provision of high quality, competent and current, individual Commandos to round out and reinforce the 2nd Commando Regiment is the main focus for the Regiment with much of its effort and resources dedicated to the task. Raised in 1955, the Regiment has grown from two independent commando companies in Sydney and Melbourne to raising a commando signals squadron and finally a regimental headquarters in 1981. In recent years the Regiment has become more frequently deployed on operations providing small detachments and individuals to Bougainville, East Timor, the Solomon Islands, and Iraq, and up to company sized combat elements to Afghanistan. The regimental badge features a silver WWII era Australian fighting knife surmounted by a gold boomerang bearing the regimental motto Strike Swiftly. 2nd Commando Regiment is an Australian Army Special Forces unit; one of three combat-capable units within the Australian Special Operations Command. The regiment was established on 19 June 2009 when it was raised from the 4th Battalion, The Royal Australian Regiment (Commando) (4 RAR (Cdo)). 2nd Commando Regiment's history stems from the decision in 1996 to convert 4 RAR, a light infantry battalion, into a Commando Regiment. 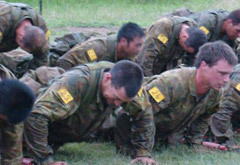 On 1 February 1997 4 RAR was renamed and re-roled as 4 RAR (Cdo) and commenced the development of Australia's first regular Commando capability. This development was conducted through a period of continuous operational tasking with collective deployments to Solomon Islands, East Timor, Iraq and Afghanistan. Throughout these operations the Regiment served with distinction, notably receiving the Unit Citation for Gallantry for its service as a part of the Special Operations Task Group in 2005-2006. 2nd Commando Regiment's new regimental badge was created to reflect the history and traditions of Australian Commandos and the offensive nature of the unit. The centre feature of the badge is a silver Fairbairn-Sykes fighting knife, universally recognised as the symbol of a Special Forces unit, and is backed by the blackened double diamonds, representative of the felt colour patches worn on Australian Commando uniforms of WWII. The regiments motto is included in a gold scroll, Foras Admonitio or latin for Without Warning. The motto highlights not only the challenges of modern warfare, but the modus operandi of 2nd Commando Regiment. The 2nd Commando Regiment has lost more soldiers KIA while deployed to Afghanistan than any other unit of the ADF. The Regiment is also actively supporting the recovery of a significant number soldiers who have been seriously wounded in battle or injured on operations and in training. Some of these soldiers will never return to full duty as Commandos. Support to the families of the fallen and to our wounded and their families is a priority of 2nd Commando Regiment. For 2nd Commando Regiment the Commando Welfare Trust is a key enabler to ensure the continued support of members and their families. On joining 2nd Commando Regiment a soldier and his family become Commandos for life. 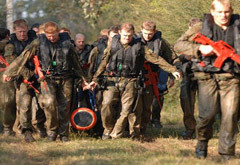 The Special Operations Engineer Regiment (SOER), formerly known as the Incident Response Regiment (IRR) provides mobility, counter mobility and specialist technical counter Chemical, Biological, Radiological, Nuclear and Explosive (C-CBRNE) capabilities in support and as part of Special Operations Command (SOCOMD). 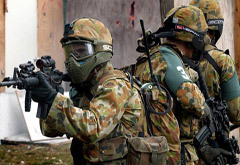 The unit originated in 1999 as a CBR, Explosive Ordnance Disposal and Search response organisation (Joint Incident Response Unit - JIRU), constituting part of the wider ADF support to the Sydney 2000 Olympic Games. The unit evolved from 2000, slowly moving away from consequence / incident management tasks and focussing on the provision of specialist support to the ADF through SOCOMD. In February 2012 IRR underwent a name change to better reflect its current role and became the Special Operations Engineer Regiment (SOER). 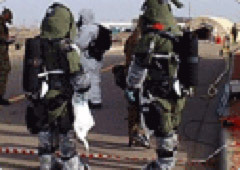 SOER continues to evolve, looking to improve its delivery of discrete, agile and highly trained teams that provide integrated, rapidly deployable and enhanced C-CBRNE capability to SOCOMD. The Special Operations Logistic Squadron (SOLS) provides close and general logistic support to all units within Special Operations Command Australia (SOCOMD). 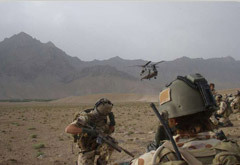 SOLS was originally established as the Special Operations Combat Service Support Company (SOCSSC) in July 2003, as part of the newly created SOCOMD, to provide second and selected third line support to Australian Special Operations Units. The unit was re-named as the Special Operations Logistic Squadron (SOLS) in 2006. SOLS is a Squadron sized element of Logisticians, responsible for providing diverse logistic support to SOCOMD in all theatres of operations, around the world. SOLS is the only independent logistic Squadron within SOCOMD and the only independent logistic Squadron within the Australian Army. Logisticians within SOLS must be able to conduct their role in arduous conditions, remote locations, and in isolated and hostile settings. This requires the members to have a maturity greater than that of a soldier in wider Army and to have a tolerance of ambiguity not expected within the regular soldier. SOLS aims to employ volunteers who are selected for their trade competency and their ability to encapsulate a culture that supports exceptional performance. Although a relatively new organisation, SOLS is proud of its short history, has high calibre people and is continually striving to provide the most effective and innovative logistic support to its dependent units. The Special Forces Training Centre (SFTC) recruits, screens and trains selected personnel for service with Commandos and the Special Air Service Regiment (SASR), in addition to managing doctrine development, marketing, training support and validation and specialist capability development. SFTCs role is to ensure the ongoing provision of high-calibre, trained individuals to Commandos and SAS to enable continuous elite military capabilities. The units badge comprises both Commando Fairbairn-Sykes fighting knife and SASR sword overlaying the flame of Gideon, representing the intense heat of the selection process. In the background is the double diamond representing Australias World War II Special Forces origins. SFTC was raised in 1999 as a Training Command unit to support, validate and develop Special Forces training however has grown significantly from these origins to now manage a broad range of training and training support tasks on behalf of Special Operations Headquarters. In 2004 SFTC became a fully fledged Special Forces unit transitioning from Training Command to Special Operations Command (SOCOMD). Quality people form the bedrock of Australian Special Operations capability. As such, the task of attracting, selecting and training physically and mentally robust individuals to provide the next generation of Special Forces operators is an essential precursor to the delivery of this collective capability to the battlefield. Physical toughness is an important attribute however is only one of a myriad of components the Special Forces operator must possess. Judgement, decisiveness, mental dexterity, leadership, innovation and humility are all core elements required by Special Forces soldiers and officers alike. These attributes will be thoroughly exposed, observed, reviewed and assessed to ensure each individual that is selected for service within Special Forces can meet the high standards that are expected of him. The SOCOMD catchcry of service with operational focus is a foundation emphasis throughout recruitment, selection and training, and only those with absolute dedication will last the process. The gravity and responsibility entailed in this commitment is evident in the fact that newly qualified members may find themselves on intense combat operations within a few months of completing reinforcement training. Upon completion of Special Forces selection and training, and subsequently operations, successful Special Forces soldiers will realise why their beret commands the respect it does. The first military parachute training unit in Australia was the Paratroop Training Unit (PTU), formed at Laverton in Victoria on 3 November 1942. On 16 November 1942 PTU was relocated to Tocumwal in NSW. PTU was subsequently transferred to RAAF Base Richmond on 6 April 1943 until it was disbanded at the end of WWII, in 1945. Parachute Training School (PTS) was formed in 1951 as Parachute Training Wing as an RAAF unit at RAAF Williamtown NSW. The first course of trainees commenced in September 1951 with instructors from both the Army and the RAAF. The Army assumed responsibility for parachute training on 14 May 1974 and the school was renamed Parachute Training School. The school relocated to Naval Air Station HMAS Albatross in 1986 and remains there to this day. In 2011 the School became a Special Operations Command unit where SF and support role paratroopers are trained in various forms of airborne capability, evaluation and testing of personnel parachute systems and associated equipment are carried out. All personnel parachute systems are repacked and repaired organically by Parachute Maintenance Wing.